Total operating revenue for the 26 largest Canadian air carriers increased 13.2% from the fourth quarter of 2016 to $5.8 billion in the fourth quarter of 2017. Total operating expenses grew 11.3% to $5.5 billion. As a result, net operating income almost doubled, rising from $112.2 million to $220.4 million. This amount, combined with a net non-operating loss of $139.8 million, produced a net income of $80.7 million. Canadian Level I and II air carriers spent $1.3 billion to purchase turbo fuel and paid $1.1 billion in wages, salaries and benefits to their 58,858 employees. The average number of employees was up 9.4% over the fourth quarter of 2016. 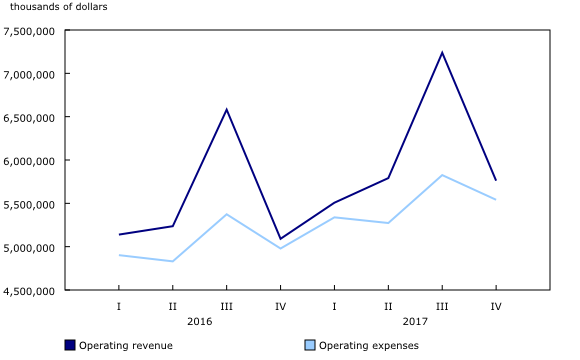 Other operating expenses accounted for the largest share (58.4%) of total operating expenses in the fourth quarter of 2017, followed by turbo fuel (22.7%) and wages, salaries and benefits (19.0%). These airlines recorded a profit margin of 1.4% (net income divided by operating revenue). In other words, every dollar of service sold in the fourth quarter earned 1.4 cents of profit for the carriers. These 26 Canadian air carriers carried 20.6 million passengers in the fourth quarter, up 8.3% from the fourth quarter of 2016. The number of passengers flying on scheduled flights rose 7.8% to 20.1 million, while the passenger counts on chartered flights increased 31.1% to 519,000. 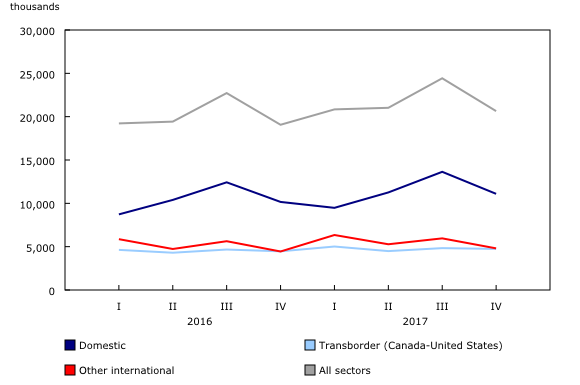 All three sectors posted gains: domestic (within Canada) rose 9.2% to 11.1 million passengers; transborder (between Canada and the United States) grew 6.2% to 4.7 million passengers; and other international increased 8.1% to 4.8 million passengers. Traffic and capacity for scheduled services both recorded notable increases in the fourth quarter. Year over year, traffic was up 9.3% to 46.8 billion passenger-kilometres, while capacity rose 8.4% to 58.8 billion available seat-kilometres. With the gain in demand greater than the increase in capacity, carriers recorded a higher passenger load factor in the fourth quarter (79.6%) for their scheduled services than in the same quarter a year earlier (79.0%). This release covers Canadian Level I and II air carriers. The number of air carriers increased from 24 in 2016 to 26 in 2017, as two Level III air carriers were promoted to Level II. These two carriers are not included in the 2016 data. Level I air carriers include every Canadian air carrier that, in the calendar year before the year in which information is provided, transported at least 2 million revenue passengers or at least 400 000 tonnes of cargo. Level II air carriers include every Canadian air carrier that, in the calendar year before the year in which information is provided, transported (a) at least 100,000 but fewer than 2 million revenue passengers; or (b) at least 50 000 tonnes but less than 400 000 tonnes of cargo. Net non-operating income and loss are from commercial ventures that are not part of the air transportation services; from other revenues and expenses attributable to financing or other activities that are not an integral part of air transportation; and from special recurrent items of a non-periodic nature. Provision for income taxes is also included. Non-operating income can be, for example, capital gains from the sale of aircraft, interest income and foreign exchange adjustment, while non-operating expenses can include capital losses and interest on bank loans and other debt. Data for the fourth quarter of 2016 have been revised. Due to rounding, components may not add to total. 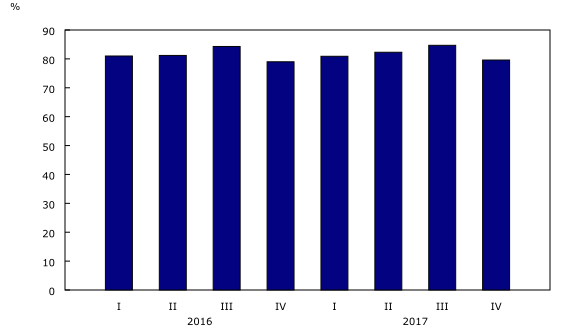 Beginning with the first quarter of 2017, the Quarterly Civil Aviation Survey is produced using Statistics Canada's Integrated Business Statistics Program (IBSP). Detailed information about the IBSP is available from the Behind the data module of our website. Changes were made to the collection method, questionnaire content, imputation and estimation, therefore users should exercise caution when comparing actual data to historical data prior to the first quarter of 2017. A summary of changes is available under Definitions, data sources and methods: survey number 2712 – Quarterly Civil Aviation Survey. Statistics Canada and Transport Canada have launched the Transportation Data and Information Hub, a new website to provide Canadians with online access to comprehensive statistics and measures on the country's transportation sector. Quarterly civil aviation data will appear later in the service bulletin Aviation (Catalogue number51-004-X).